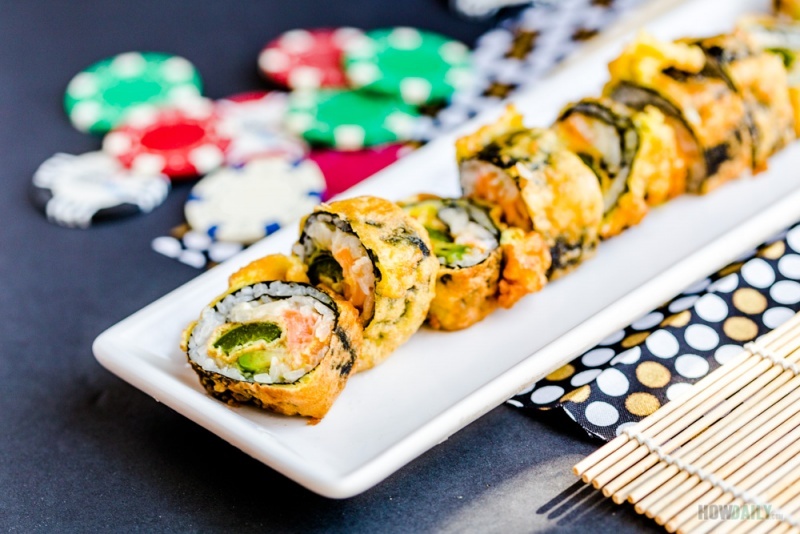 Western fusion of the traditional sushi, meet the new creation: Las Vegas sushi roll, an appetizer to enjoy at that reunion party or your next gambling arcade. The nice thing is, you can serve this cook or raw, or somewhere in between to variate the taste and they will all be fabulous. 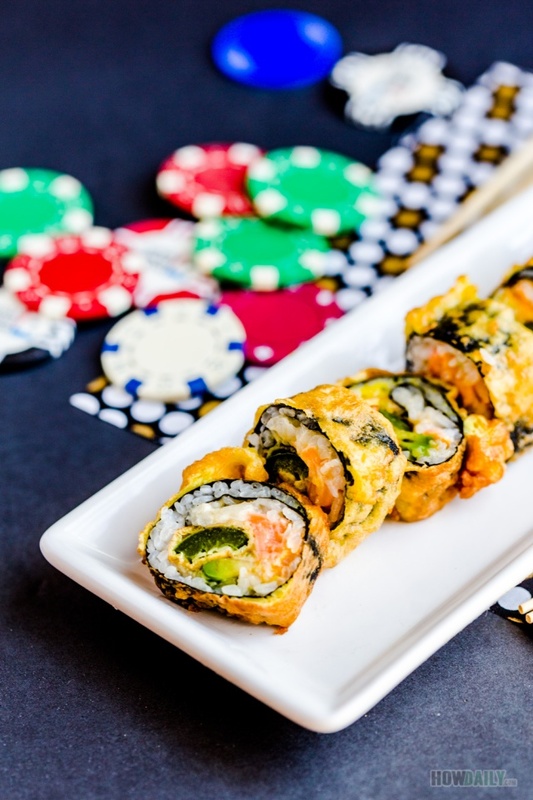 You will need two small portion of tempura batter, one for the jalapeno and the other for the whole sushi rolls. So be prepare with the dry batter and only mix in liquid as you need to keep the batter icy cold. Parchment paper are nice to have to catch excess dripping oil, but a basket or metal strainer will do. For the sushi rice, since this roll combines three ingredients plus lots of fat and grease (mayo, avocado, fried batter…), I would say go light on the rice and make it thin with less sushi rice than usual. If you’re a fan of pickle, add a couple slice into the roll to give it a refreshing taste next to those buttery ingredients. Since the outer shells are tempura batter, these sushi pieces can be served together with lots of combination. 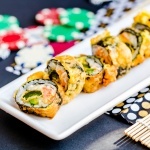 A typical combo of picked ginger and wasabi is perfect for the lightly fried roll (i.e. salmon still pinky raw inside). You could also use tempura dipping sauce instead of the regular soy sauce; or throw in some salt with the tempura batter and skip the sauce over all. Anyhow, enjoy picking and good luck on the gacha-gacha !! Buttery sushi that just melt in your mouth. Enhance with a little spicy from the South, just roll up the dice and enjoy la fiesta. Wash, clean and cut jalapeno pepper into halves along its length to remove all seeds (under running water to avoid hotness). Slice jalapeno into thin long strips. Cut avocado into long thin strips. Prepare the cold Japanese tempura batter, you can buy box mixed batter or follow this guide here. Coat and fry jalapeno, then set aside. See detail guide with video on rolling maki sushi or simply put, just laid out each nori sheet on bamboo mat over flat surface. Use about 2/3 of each nori sheet and 1/2 to 3/4 cup of sushi rice for each roll. Just fold nori sheet at its desire length and tear it off. Spread sushi rice evenly on nori surface. 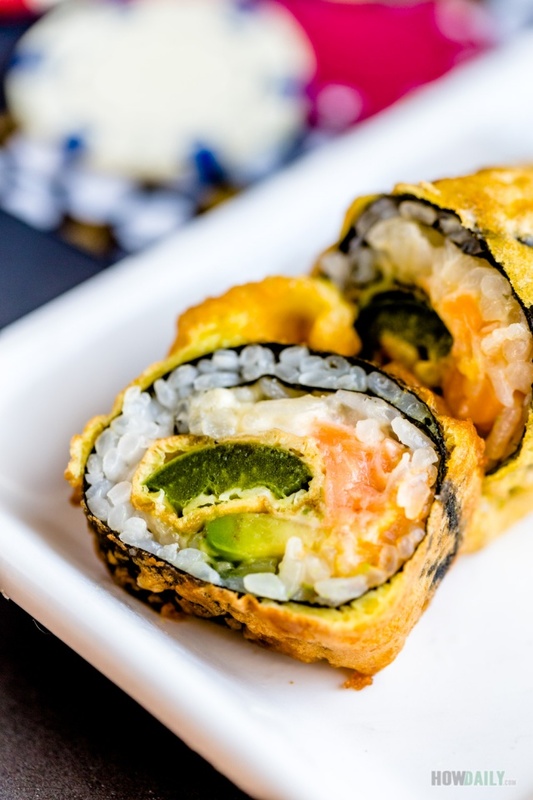 Arrange all fillings: tempura jalapeno, salmon, avocado and drizzle on some Kewpie mayo. Remember to go light on the mayo and leaving 1/2 inch off at both ends. Doing this will prevent mayo to ooze out when you roll. Quickly lift, cover, hold, press and roll them away. Finally, deep each roll into tempura batter and deep fry on hot oil for 1-3 minutes or until desired crispiness. Let them seat on parchment paper to drip off excess oil before slicing into bite size pieces.